If you own a dog or cat, it is almost certain at one time or another that you will have to deal with fleas. And that’s where the trouble begins – not just with the fleas themselves, but with the vast array of commercial flea control products available. Ironically, the majority of these products, even the most popular ones, contain unsafe, harmful ingredients. Often these ingredients are toxic to the very animals they are supposed to protect – and can even do harm to you and your family. The National Resource Defense Council’s website for pet owners, www.greenpaws.org, offers a comprehensive list of commercial flea and tick products, their ingredients, and whether they are safe. You’ll be surprised to learn that most of them contain harmful chemicals. The most popular treatments require expensive monthly applications during flea season, for the life of your pet. Frontline Plus, for example, can cost from $10 – 15 for each application. This means flea control can become costly, very quickly. What’s the alternative? Natural Flea Control! Natural flea control uses natural techniques and substances in the fight against fleas. In most cases, you will find that natural substances are commonly available and, as a result, are much cheaper than commercial products. Natural substances are often far less toxic as well. It’s important to point out, however, that “natural” doesn’t always mean safe. Here is an example. Natural substances effective for flea control include “essential oils,” which are botanical compounds in highly concentrated form. One of these essential oils, pennyroyal, has been proven effective in flea control – but pennyroyal is toxic when applied to the skin of a dog or cat. In fact, it can be deadly if ingested. Since animals commonly lick themselves when they have fleas, they could lick the pennyroyal with dire consequences. You might make the assumption that pennyroyal is safe because it is a “natural” oil. You would be dead wrong. That’s why you need to carefully evaluate any natural flea control substances before you use them on your pet. 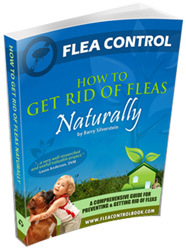 Please refer to our book, Flea Control: How to Get Rid of Fleas Naturally, for comprehensive information!